THE FACTS: Drugs being brought across borders are only part of the problem contributing to the nation’s opioid crisis. According to the U.S. Centers on Disease Control and Prevention, about 40 percent of the opioid deaths in 2016 involved prescription painkillers. Those drugs are made by pharmaceutical companies. Some are abused by the people who have prescriptions; others are stolen and sold on the black market. The flow of heroin into the U.S. from Mexico is a major problem, but drugs that are brought from other countries don’t all come over land borders. Illicit versions of powerful synthetic opioids such as fentanyl, which are a major factor in rising overdose numbers, are being shipped directly to the U.S. from China. THE FACTS: The bipartisan National Governors Association doesn’t think he’s lived up to that commitment. Earlier this month, the governors called on Trump and Congress to do more to pay for and coordinate a response to the opioid epidemic. The Trump administration has allowed states to begin allowing states to seek permission to use Medicaid to cover addiction treatment in larger facilities — a measure advocates say is needed. THE FACTS: This statement is inaccurate. It’s true that more than 1,500 firings at the VA have occurred so far during the Trump administration. But more than 500 of those firings occurred from Jan. 20, when Trump took office, to late June, when the new accountability law began to take effect. That means roughly one-third of the 1,500 firings cannot be attributed to the new law. Congress passed the legislation last June making it easier to fire VA employees and shortening the time employees have to appeal disciplinary actions. But the law’s impact on improving accountability at the department remains unclear: More VA employees were fired in former President Barack Obama’s last budget year, for instance, than in Trump’s first. THE FACTS: “Open borders” is an exaggeration. 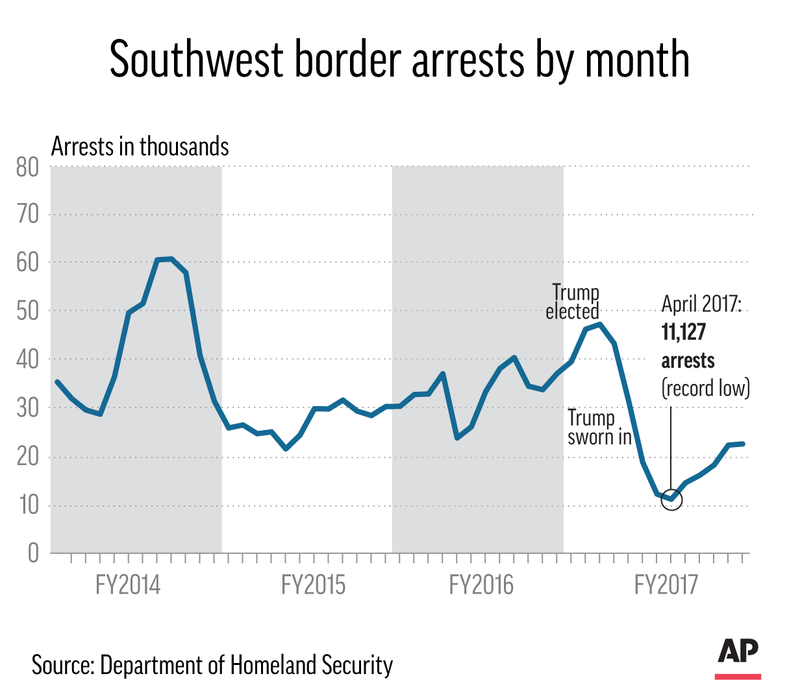 Border arrests, a useful if imperfect gauge of illegal crossings, have dropped sharply over the last decade. The government under Presidents George W. Bush and Barack Obama roughly doubled the ranks of the Border Patrol, and Bush extended fencing to cover nearly one-third of the border during his final years in office. The Obama administration deported more than 2 million immigrants during the eight years he was in office, more than in previous administrations. Studies over several years have found immigrants are less likely to commit crimes than people born in the United States. THE FACTS: It’s not happening because the waiting list is so long. There is currently no wait for U.S. citizens to bring spouses, children under 21 and parents. But citizens must petition for siblings and adult children, and green-card card holders must do the same for spouses and children. On Nov. 1, there were 4 million people in line for family-based visas, according to the State Department. The waits are longest for China, India, Mexico and the Philippines. In January, Mexican siblings of U.S. children who applied in November 1997 were getting called, a wait of more than 20 years. An immigrant could theoretically bring an uncle by bringing a parent who then brings his sibling, but the wait would be interminable for most. THE FACTS: No, it’s not gone. It’s going, in 2019. People who go without insurance this year are still subject to fines. Congress did repeal the unpopular requirement that most Americans carry insurance or risk a tax penalty but that takes effect next year. 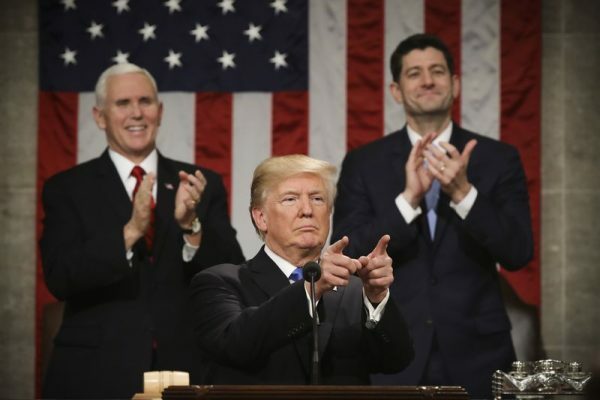 Other major parts of the overhaul remain in place, including its Medicaid expansion, protections for people with pre-existing conditions, guaranteed “essential” health benefits, and subsidized private health insurance for people with modest incomes. THE FACTS: He’s wrong about recent decades. The auto industry has regularly been opening and expanding factories since before became president. Toyota opened its Mississippi factory in 2011. Hyundai’s plant in Alabama dates to 2005. In 2010, Tesla fully acquired and updated an old factory to produce its electric vehicles. Trump also declared that “Chrysler is moving a major plant from Mexico to Michigan.” That’s not exactly the case, either. Chrysler announced it will move production of heavy-duty pickup trucks from Mexico to Michigan, but the plant is not closing in Mexico. It will start producing other vehicles for global sales and no change in its workforce is anticipated. THE FACTS: Although it’s true that the Islamic State has lost nearly 100 percent of the territory it held in Syria and Iraq when the U.S. began airstrikes in both countries in 2014, Syria remains wracked by civil war, with much of that country controlled by the government of Russian ally Syrian President Bashar Assad and not by U.S.-allied groups. The Iraqi government has declared itself fully liberated from IS. The progress cited by Trump did not start with his presidency. 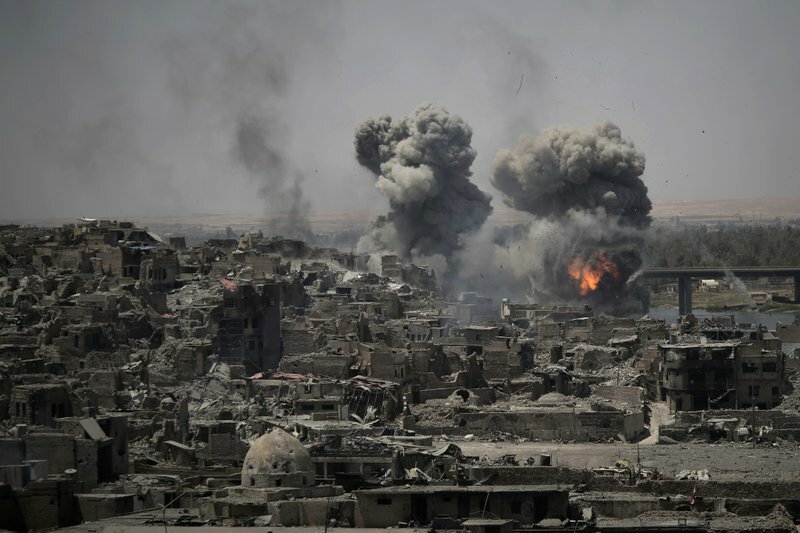 The U.S.-led coalition recaptured much land, including several key cities in Iraq, before he took office. And the assault on Mosul, which was the extremists’ main stronghold in northern Iraq, was begun during the Obama administration. But in the past year the counter-ISIS campaign has accelerated, based largely on the approach Trump inherited. He’s right that more remains to be done to eliminate IS as an extremist threat, even after it has been defeated militarily. The group is still able to inspire attacks in the West based on its ideology, and it is trying to make inroads in places like Afghanistan and Libya. THE FACTS: That depends on how you define “tremendous.” The biggest beneficiaries from the tax law are wealthy Americans and corporations. Most Americans will pay less in taxes this year. 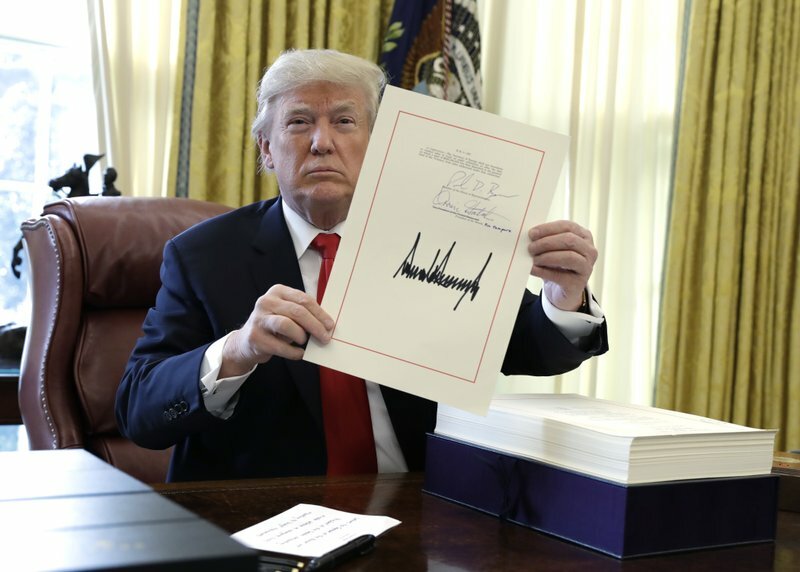 The nonpartisan Tax Policy Center estimates that about 80 percent of U.S. households will get a tax cut, with about 15 percent seeing little change and 5 percent paying more. Middle-class households — defined as those making between roughly $49,000 and $86,000 a year — will see their tax bills drop by about $930, the Tax Policy Center calculates. That will lift their after-tax incomes by 1.6 percent. The richest 1 percent, meanwhile, will save $51,140, lifting their after-tax incomes by 3.4 percent, or more than twice as much as the middle class. THE FACTS: No truer now than in the countless other times he has said the same. The December tax overhaul ranks behind Ronald Reagan’s in the early 1980s, post-World War II tax cuts and at least several more. An analysis by the Committee for a Responsible Federal Budget in the fall put Trump’s package as the eighth biggest since 1918. As a percentage of the total economy, Reagan’s 1981 cut is the biggest followed by the 1945 rollback of taxes that financed World War II. Valued at $1.5 trillion over 10 years, the plan is indeed large and expensive. But it’s much smaller than originally intended. Back in the spring, it was shaping up as a $5.5 trillion package. Even then it would have only been the third largest since 1940 as a share of gross domestic product. THE FACTS: This appears to be true, but may not be as impressive as it sounds. According to a tally of public announcements by Americans for Tax Reform, a conservative group that supported the tax law, about 3 million workers have gotten bonuses, raises or larger payments to their retirement accounts since the tax law was signed. That’s about 2 percent of the more than 154 million Americans with jobs. The Labor Department said before the tax package was signed into law that 38 percent of workers would likely get some form of bonus in 2017. Few companies have granted across-the-board pay raises, which Trump and GOP leaders promised would result from the cut in corporate tax rates included in the overhaul. Many, such as Walmart and BB&T Bank, said they will raise their minimum wages. Walmart made similar announcements in 2015 and 2016. THE FACTS: Energy production was unleashed in past administrations, particularly Barack Obama’s, making accusations of a “war on energy” hard to sustain. Advances in hydraulic fracturing before Trump became president made it economical to tap vast reserves of natural gas. Oil production also greatly increased, reducing imports. Before the 2016 presidential election, the U.S. for the first time in decades was getting more energy domestically than it imports. Before Obama, George W. Bush was no adversary of the energy industry. One of Trump’s consequential actions as president on this front was to approve the Keystone XL pipeline — a source of foreign oil, from Canada. What Does Mars Water Mean for Chances of Alien Life?